The dedication ceremony presided by Bishop Jessie T. Peck for the United Methodist Church on Chesnut Street was held on Nov. 8, 1877. The cornerstone was laid on Aug. 29, 1876, and after a year and a half, it was completed at a cost of $18,000. The first public worship service was held ealier that yean on September 13. On Nov, 3, 2012 Dansville United Methodist Church celebrated its 200th anniversary with a special service Saturday evening as about 100 people, including participants, joined together to commemorate the church’s milestone. Members of the Methodist faith first settled in Dansville in 1812. The first preaching minister was Robert Parker, who moved to Sparta in 1805. Parker recognized the need to build a church building and began to raise the necessary funds. Less than $1,000 was secured and the church was commenced. 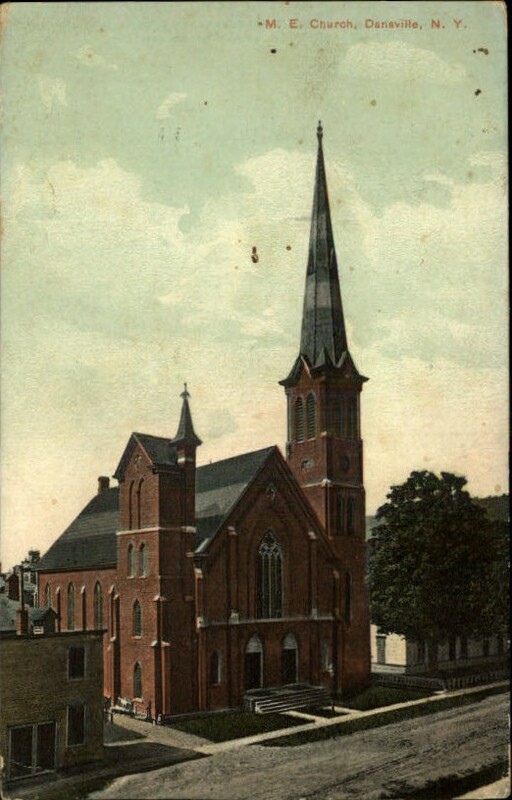 The church was erected on the public square, a short distance south of the present location of Dansville Presbyterian Church. The church’s congregation continued to grow and remained there for nearly 50 years. In the year 1876, the old church became too small and dilapidated, and so it was decided to build a new brick church on Chestnut Avenue.